Earlier this week, Apple notified users living in China that their data would be moved to a Chinese company's servers in compliance with local laws. There was some confusion, however, as a number of customers who currently live outside of China received the same message. Apple on Friday clarified the situation with a follow-up email that notes only iCloud users living within China, or whose Apple ID country is China, will see their iCloud data migrated to servers operated by Guizhou-Cloud Big Data Industry Co. Ltd., reports TechCrunch. The iCloud data handover is in compliance with Chinese internet regulations covering cloud services owned by foreign corporations. 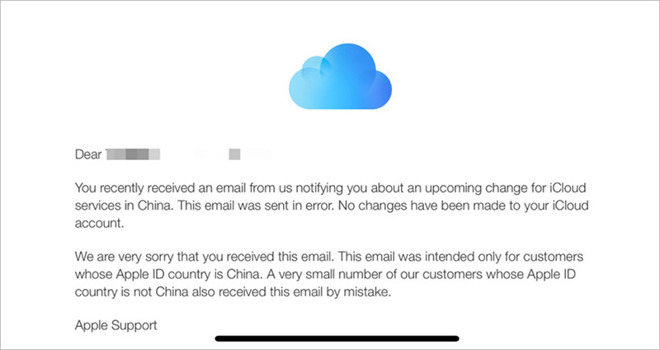 You recently received an email from us notifying you about an upcoming change for iCloud services in China. This email was sent in error. No changes have been made to your iCloud account. We are very sorry that you received this email. This email was intended only for customers whose Apple ID country is China. A very small number of our customers whose Apple ID country is not China also received this email by mistake. On Wednesday, Apple told Chinese Apple ID holders that it will pass control of its iCloud services to GCBD in late February. TechCrunch later discovered a number of U.S. iCloud users received the email meant for Chinese customers. How the mixup occurred is unknown, though Apple did confirm the validity of the follow-up email. The data migration and similar actions by other companies have riled privacy advocates who cite China's strict internet censorship practices as reason for concern. Apple, however, claims its partnership with GCBD, which dates back to last year, grants customers strong data privacy and security protections. Importantly, the company promises no backdoors will be created by government agencies or other entities. Those who do not wish to have their iCloud account data moved to GCBD have until the end of February to terminate their account.